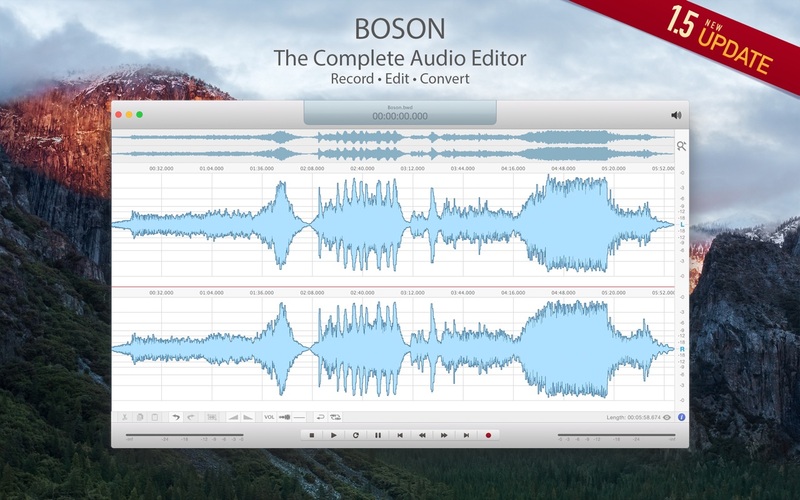 Boson is a modern, easy-to-use audio editor optimized to make full use of your Mac’s power. With Boson you can record audio, edit existing audio files, convert your music between the most common audio file formats, digitize your old vinyl records, or record internet radio stations. Whatever you need to get done – if it has something to do with audio – Boson is your best bet! Easy to Use (for beginners and pros alike) – Boson is easy to use and beginner-friendly. The included manual features an easy to follow introduction to audio editing and recording and the “cook book” section gives step-by-step instructions on how to perform the most common tasks (like creating a MP3 file or recording music from a website and much more). Highest Quality Possible – Boson uses a heavily optimized editing engine that operates on 32bit sample values. That’s why with Boson you can apply effects without fear of introducing any artifacts or errors. Battery-Friendly Recording – Boson features an optional low power mode which saves up to 80% battery power during recording. Ideally for when you want to perform extensive recording tasks out in the field without an outlet in sight. Once this mode is activated Boson will keep CPU and GPU utilization to a minimum. 100% Retina Ready – Boson heavily uses Core Animation to achieve a smooth 60 frames per seconds when drawing wave forms. Even on Retina Macs! Gone are the days of jerky scrolling and zooming.